SAFE Working For You! Visit Us at Sun ‘N Fun! SAFE (Society of Aviation and Flight Educators) is a relatively new and dynamic not-for-profit. Our mission is to promote excellence in aviation education and thereby raise the level of safety and professionalism in our whole industry. We want nothing less than to change the aviation world for the better. Thank you for reading our blog. We have enjoyed a tremendous following here thanks to your interest. Please “follow” us for notification of new content. We also publish a quarterly magazine for members edited by the very talented Mark Phelps. Our SAFE Toolkit App has received amazing activity and rave reviews. Utilizing this FREE software makes all CFIs better prepared in the field. It contains the FAA endorsements and pilot experience requirements (and so much more) right in your pocket to do your job more professionally. [See it at work]. One of our proudest and most effective safety programs is our SAFE mentoring system. This enables a new CFI to sign up and gain an experienced guide in the process of becoming a really effective and excellent instructor. A lot of learning as an educator is necessarily an apprenticeship. This program passes on the wisdom from experienced, sage-like wizards to fresh excited beginners. Become a mentor and pay it forward. We are currently working with a talented web and media designer, Chris Palmer, to entirely revamp our web presence and make it as exciting and inviting as all of aviation; a portal for member participation. And lastly, we are organizing, with other aviation partners the Pilot Proficiency Aviation Symposium to occur in Oshkosh on July 24-25, just before Air Venture. This gathering will actively engage all aviation professionals and help us discover a better way forward in flight training (just as our last gathering in Atlanta did.) Expect great things, join us and help support our mission of raising the bar on aviation education professionalism. Our amazing member benefits pay you back and make this commitment painless and fun. 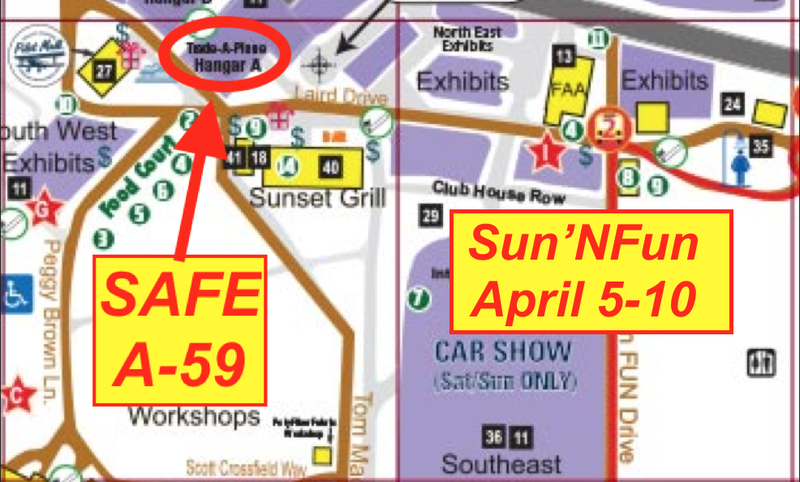 Visit us at Sun ‘N Fun in Building A Booth #59. Attend a seminar by a SAFE member, we would love to meet you! Practical writing , I learned a lot from the info , Does someone know if my business might obtain a sample a form example to use ?